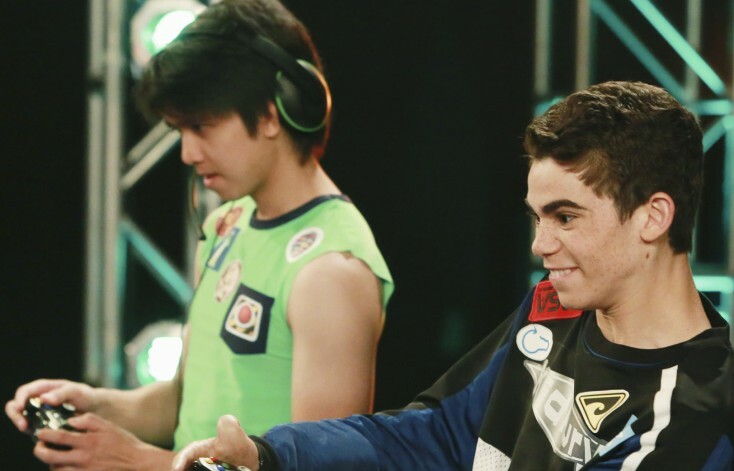 HOLLYWOOD—Cameron Boyce has been a familiar face on the Disney Channel playing Luke Ross in “Jessie.” As Boyce grows up on the network, he takes on a lead role in the upcoming TV series “Gamer’s Guide to Pretty Much Everything,” premiering on Disney XD Wednesday, July 22. In the new comedy, Boyce plays cool and likable Conor who is on a professional gamers tour in the professional video gaming world. When Conor, a.k.a. “Kid Fury,” injures his thumb, it causes him to lose his ranking and his video game sponsors, in turn forcing him to live a regular life of school instead of private tutoring. While recovering from his injury, Conor makes friends with other gamers at school to help fast track his status back to the top of the gaming world while he heals. Wendell (Murray Wyatt Rundus), an aggressive gamer, Ashley (Sophie Reynolds), a sports-minded yet air-headed gamer and the gamer-groupie Franklin (Felix Avitia) come together as pals with Conor as they bring fun and antics in the real world while enjoying the gaming world together. Q: Cameron, some of your cast mates mentioned that you’ve helped make everyone feel like they are part of the family. Is that something you usually do when you’re on a new set or show? Boyce: Honestly, that’s the most important thing because when you talk about chemistry, you can see it on set, on screen. That’s really important. You want to wake up and say, “I’m looking forward to going to work in the morning.” It’s really important to get everybody involved. Everybody’s in on the action and we’re just all having a good time. That’s really important for the results of the show and also coming on set and being happy on set. Q: Do you feel the friendship and family camaraderie on set? Rundus: Everyone just clicked. We went to this bowling party and it was so cool being around (the cast). We felt like immediate friends as soon as we met each other. Cameron made it extremely easy coming from “Jessie” and showing us the ropes. Reynolds: Absolutely. Those boys are my family. They’re awesome (and) so much fun to work with. Avitia: It’s like a second home here with my second family. We just “gelled” together really well. Really quickly and I was really happy with that. Q: This new show is about gamers. Are you a gamer in real life? Reynolds: I am so much not a gamer. I’m learning a lot and having fun learning about it but I am not exactly a gamer. Boyce: I have a few video gamers that I like but my friends are way better than me. They beat me at all their games, which they probably cheat. I don’t know. I’m not a huge gamer but a few games I like such as “NBA 2K.” That’s my favorite. Rundus: I am a big gamer. I’ve been playing since I was six or seven years. I’ve been playing all of my life and this is why this is such a great experience for me. It was so good to get this role because I’m a huge gamer. It makes my two favorite things to do in one. Avitia: I am a big console gamer. Q: Tell us a little bit about your characters. Avitia: My character Franklin is very positive, very energetic and always wants to put a smile on people’s faces. He has a very big heart. He’s a little gullible, which sometimes gets him in trouble but he always has his friends knowing they got his back and he’s got their back. That’s what I love about him. And he’s very adventurous. Rundus: Wendell is very self-confident. If he does something wrong, he still thinks it’s good. He’s a very interesting guy. He gets along with his friends but at the same time he’s so cocky that it’s so weird being around him. He’s also very sneaky. He likes being like a Navy SEAL or a ninja jumping into buildings and stuff like that. Wendell is very cool. He has an interesting wardrobe. Reynolds; Ashley is a really fun, sweet girl. She’s the only girl of the four cast members. She’s not really book smart but a really great friend and an amazing gamer. Q: Ashley seems likes she wants to be a gamer but also wants to be a jock. Reynolds: Yes. She does. She’s a volleyball player. There is that little bit of her that is always going to be afraid that people are going to judge her video games. I hope that you get to see (in the show) that as she goes along that she kind of embraces all sides of her because it all works and all goes together. Q: In real life, you’re more of a dancer than a gamer. Do you think we might see a little of that on the show? Reynolds: Yeah. I’ve been dancing since I was three and (I’ve) grown up dancing. I am a trained dancer. I think you’ll probably be seeing a little bit of dancing in the future so stay tuned for that. Q: How excited are you to be on this show? Avitia: I am thrilled and honored and blessed to be on “Gamer’s Guide To Pretty Much Everything.” I’m so excited. Q: Cameron, your character hasn’t had a traditional education but is forced to attend school by his mom. Tell us about your own school experience. Boyce: Real school education is right back here in a little dingy room (He points to the back of the set). It’s cool. I go to an independent study (program) so it’s kind of like online college. It’s not online. We have actual books. Actually, the teacher comes to us. She also has a couple of different actors on this lot. (Actress/singer) Zendaya and all the guys on “Bunk’d.” She comes and checks our work and does that kind of thing. Boyce: It’s funny. We have a blast and it shows. I think it’s really a funny funny show. Every character has that something that’s just like “Wow! That’s hilarious.” And moments—we all have moments. It’s really fun.